Although surgical resection is the definitive treatment method for intrahepatic bile duct stones, it might be contraindicated for patients with conditions such as advanced malignant tumors or organ failure. An endoscopic approach might offer an alternative for treating intrahepatic bile duct stones. 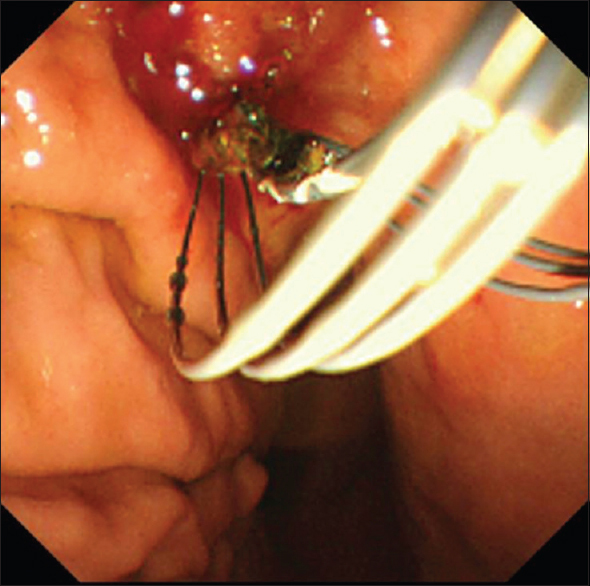 However, intrahepatic bile duct stone removal can be challenging if patients are complicated with bile duct stricture or surgical anastomoses. EUS-guided hepaticogastrostomy (HGS) has the potential for treating not only biliary drainage but also intrahepatic bile duct access., Here, we offer technical tips for intrahepatic bile duct stone removal via an EUS-HGS route. A 62-year-old female was admitted to our hospital with intrahepatic bile duct stones and frequent complication with acute cholangitis. She underwent distal gastrectomy with Roux-en-Y gastrojejunostomy to treat gastric cancer 3 years ago, followed by hepatectomy for liver metastasis of colon cancer 2 years after that. Therefore, we initially considered an EUS-guided approach. The intrahepatic bile duct was punctured using a 19G FNA needle, and contrast medium was injected. 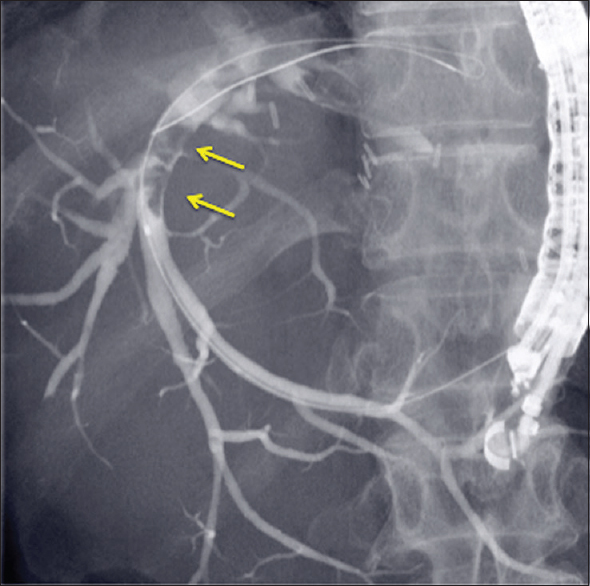 Cholangiography images showed several intrahepatic bile duct stones [Figure 1]. 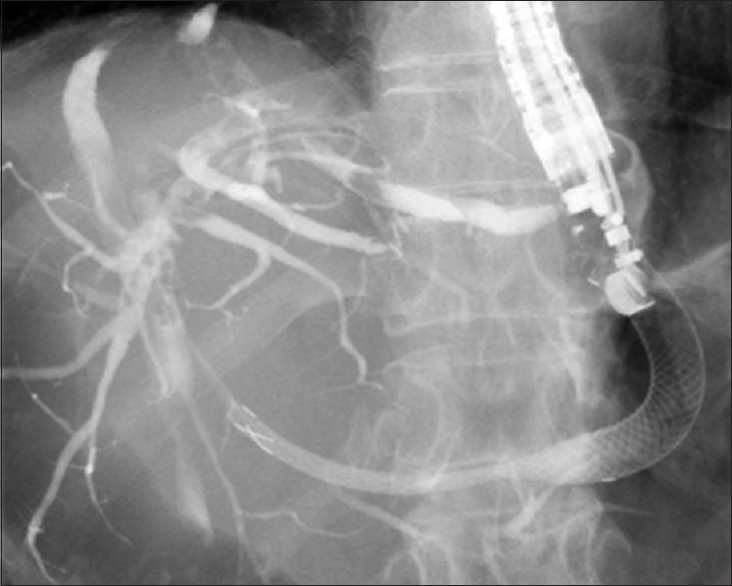 After, the fistula was dilated using a balloon catheter, a covered metal stent was deployed [Figure 2] and [Video 1]. 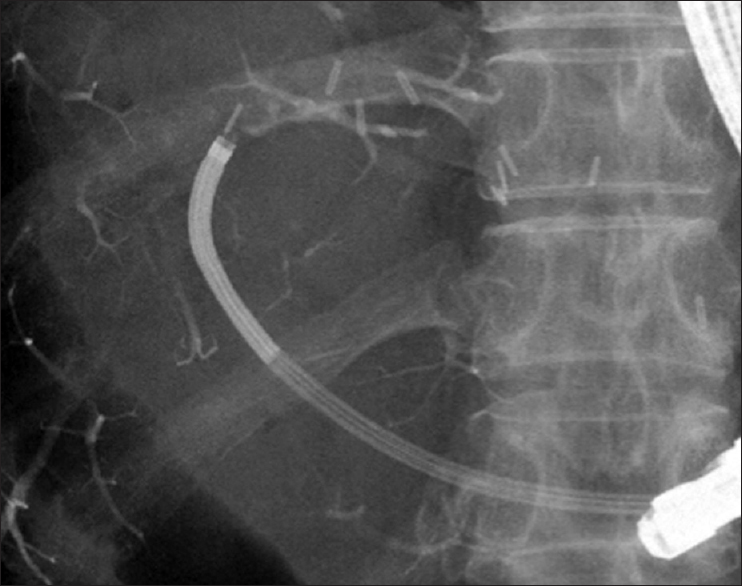 The stent was removed 1 week later, and the stones were fragmented by electrohydraulic lithotripsy through a digital single-operator cholangiopancreatoscope (SpyGlass DS; SPY-DS, Boston Scientific) inserted into the biliary tract through the EUS-HGS route [Figure 3]. 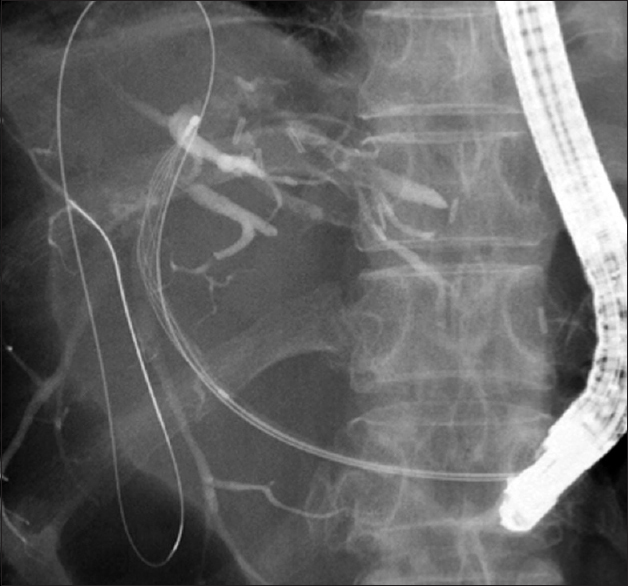 After that, the stones were cleared without any adverse events using basket and balloon catheters [Figure 4] and [Figure 5]. 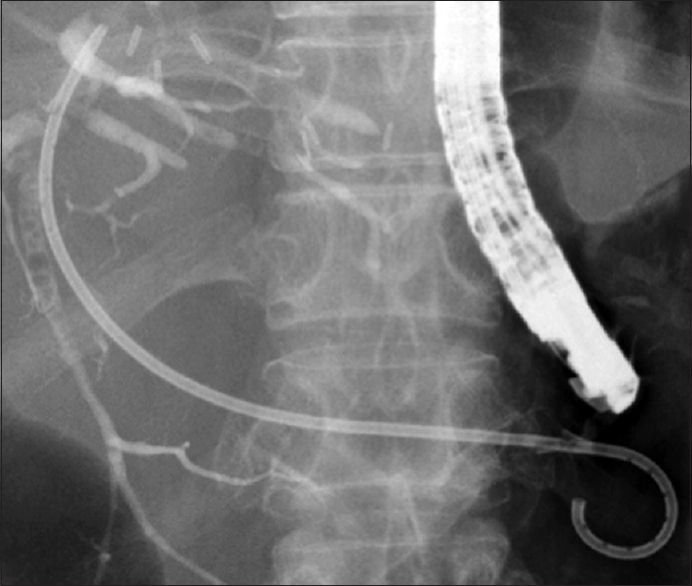 The fistula was maintained by deploying an 8.5Fr plastic stent from the intrahepatic bile duct to the stomach [Figure 6] and [Video 2]. This technique might be applicable to selected patients with intrahepatic bile duct stones. The authors certify that they have obtained all appropriate patient consent forms. In the form the patient has given her consent for her images and other clinical information to be reported in the journal. The patient understand that her name and initial will not be published and due efforts will be made to conceal her identity, but anonymity cannot be guaranteed. Mori T, Sugiyama M, Atomi Y. Gallstone disease: Management of intrahepatic stones. Best Pract Res Clin Gastroenterol 2006;20:1117-37. Dhir V, Isayama H, Itoi T, et al. Endoscopic ultrasonography-guided biliary and pancreatic duct interventions. Dig Endosc 2017;29:472-85. Ogura T, Takagi W, Kurisu Y, et al. Technical tips for peroral transluminal cholangioscopy using novel single-operator cholangioscope (with videos). J Hepatobiliary Pancreat Sci 2016;23:E25-9.